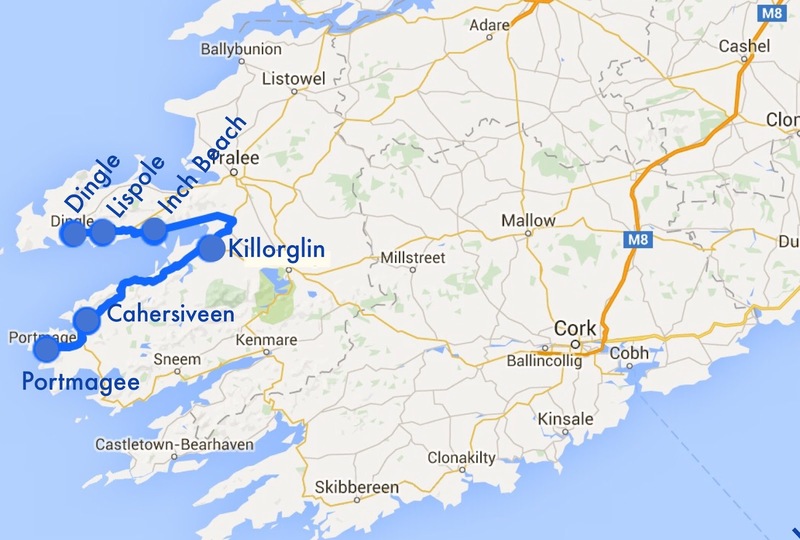 Day 16: Cahirsiveen to Dingle. After breakfast at the hotel, we filled up the car at the petrol station conveniently located across the street. When we asked about a refrigerator at check-in last night, we were given a free upgrade to a suite but its refrigerator was unplugged. Unfortunately, in his eagerness to offer us food preservation convenience, the innkeeper cranked down the fridge's temperature to its lowest setting. This morning all our food was frozen solid, so we were happy to see a SuperValu market attached to the gas station. After replacing enough food for lunch, we headed east toward the mainland and Tralee, our intended destination for yesterday. 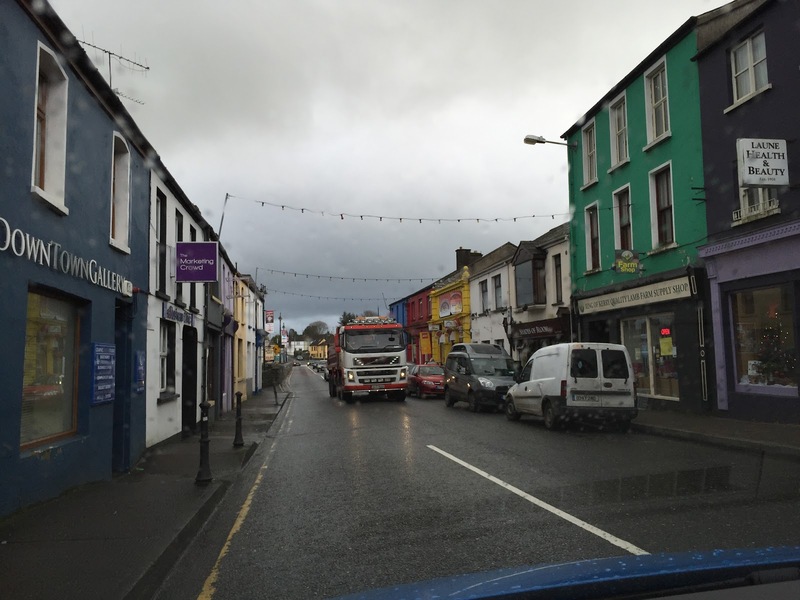 As we were about to exit the town of Cahersiveen, we reasoned that Tralee was only 42 miles away and decided to head back west about 15 miles to search for a letterbox at the end of the peninsula. Why? It wasn't as if we believed we could actually find the box. Not the way our luck had been running. Moreover, our complete befuddlement in the search for another letterbox by this same planter yesterday should have dashed any hope of finding this one. In fact, we had deliberately avoided driving out of the way for this very box yesterday. 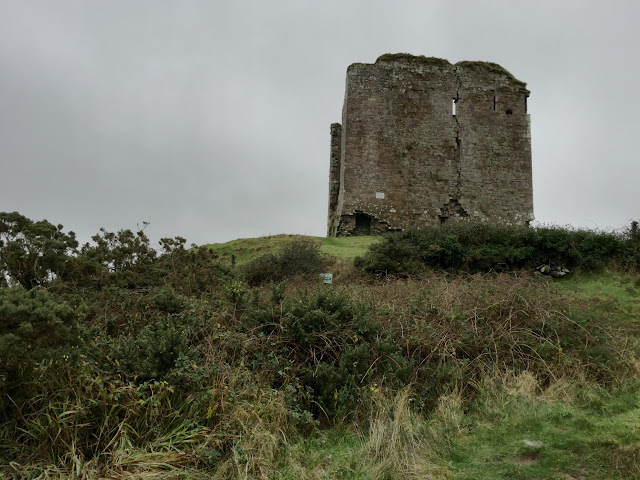 But the morning brought new hope (or delusion), so return we did, all the way to Portmagee at the end of the peninsula, where we found ourselves just as mystified by this clue as we were by the one yesterday. After mucking about in the rain for 20 minutes without success, we suddenly remembered that we had revised our plans last night. Our place of rest tonight was not Tralee; it was Dingle—only 18 miles away on the next peninsula north if we had a boat or plane. But we didn't, so we were looking at four or five hours with sightseeing stops along the way. Back east we went and re-entered Caherciveen just before 11 a.m. As we drove through town this time, Ken noticed a dentist office on the main street. This discovery was very meaningful to him because he developed an abscess on his gum a few days ago. When he discovered it, we communicated by phone with our dentist at home, who advised Ken to take the round of Amoxicillin which we had in our bag of meds and massage the gum in an effort to dislodge any foreign matter, presumably a particle of food lodged between the gum and the tooth. 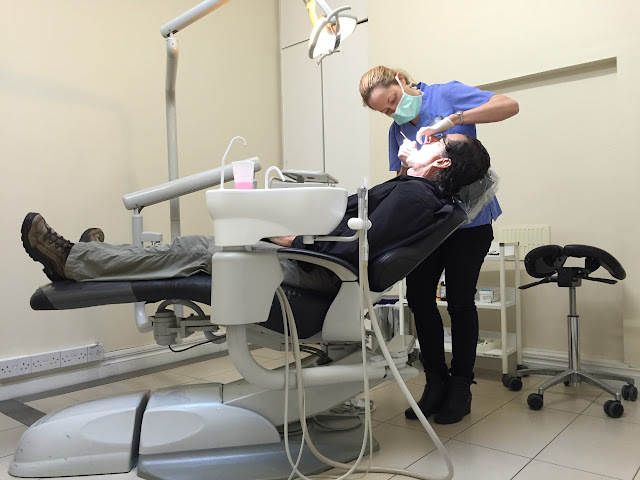 Of course, from some four thousand miles away, our dentist was understandably concerned about the likelihood of this home road treatment's success. So when Ken saw Dr. Riordan's office along our path, we decided to stop and see if he could be examined from a bit closer range. He couldn't have been treated better or more promptly if we had been home. Yes, the dentist would work him in and did so in short order. After taking an x-ray and probing, she arrived at the same conclusion—that foreign matter was the culprit. The fee was a fraction of what we would have paid in the U.S.—$45 for the examination and x-ray and a prescription grade mouthwash. 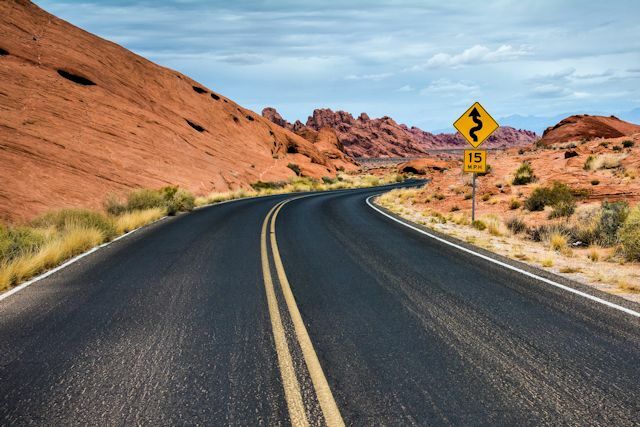 Our peace of mind greatly improved, we returned to the car and continued on our way back east. Within a couple of hours, what we assume was the offending particle made its way out of Ken's gum. Hooray for Dr. Riordan! Back on the Ring of Kerry, we drove east to Killorglin, where we saw dozens of secondary school students on lunch break. 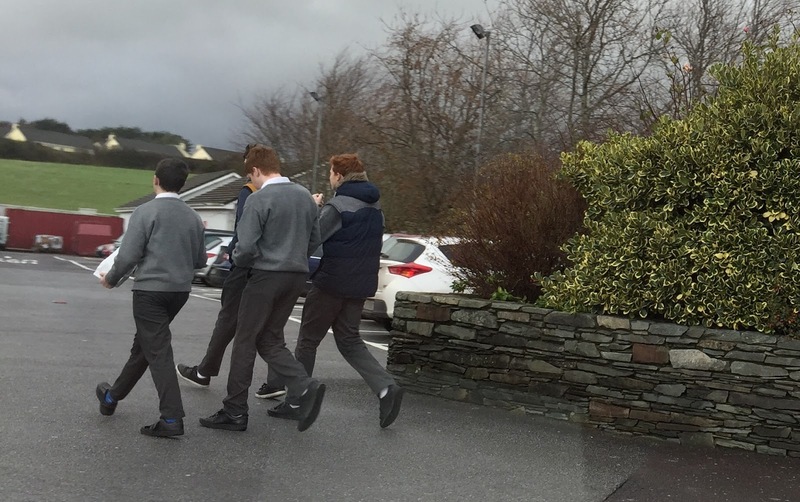 Since most Irish schools do not have a cafeteria, or canteen as they are known locally, students either bring lunch from home or walk to a nearby eating establishment for their mid-day meal. Based on the number of students who were eating as they walked, we assume that the lunch break does not allow for a leisurely meal. 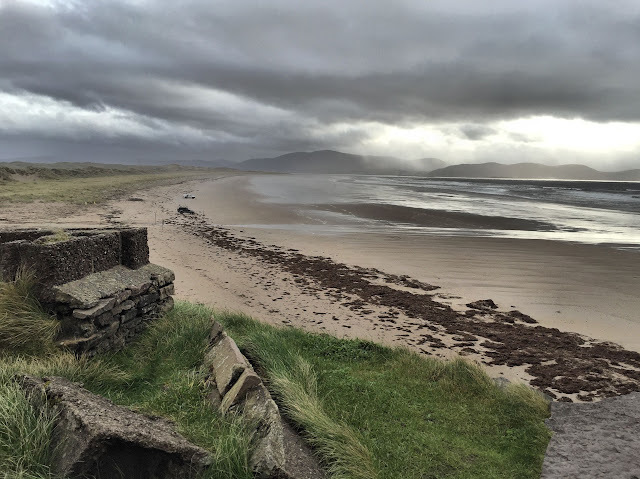 From Killorglin, we left the Ring of Kerry and the Iveragh Peninsula, heading to another of Ireland's "Five Fingers," rugged peninsulas carved out of the coastline by the Atlantic. As we left town, we were treated to the sight of a faint rainbow emerging from the low gray clouds. 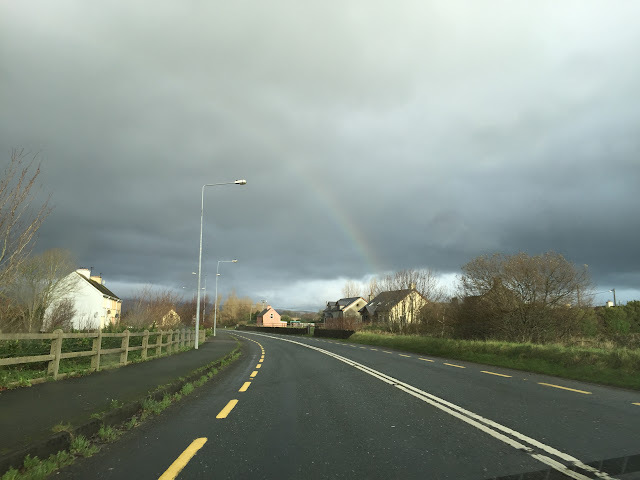 Being in Ireland, we were sure there was a pot of gold at its end but the arc faded too quickly for us to have a chance of finding the treasure. 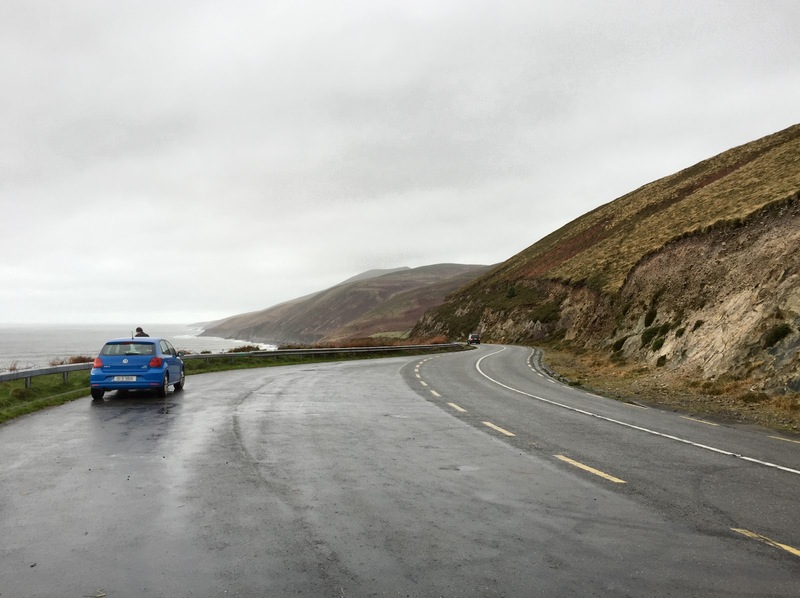 As we began our drive out the Dingle Peninsula, we were traversing the northernmost of the "fingers." 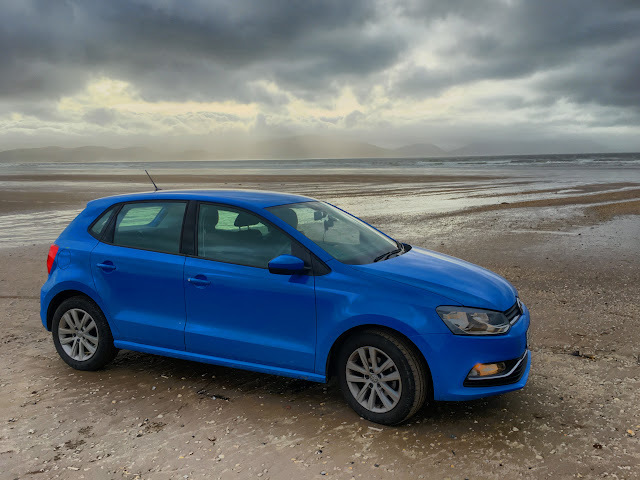 The sandy expanse of Inch Beach lured us into a stop, and the car-friendly beach reminded us of St. Augustine and Daytona Beach. There were no other cars on the beach today, but we could imagine it looking like a crowded parking lot in the summer. Beachside snack shacks were shuttered for the season, as were the restrooms with sand piled up against the doors. 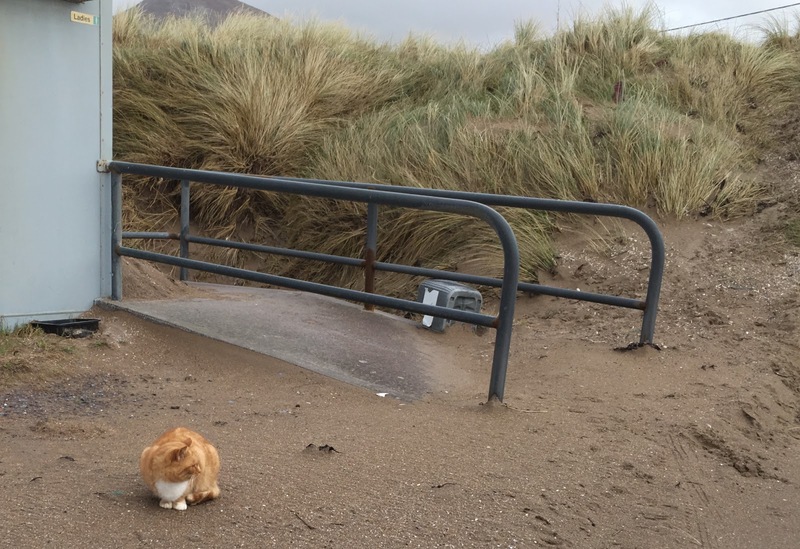 Only a few feral cats ventured forth to greet us, but they quickly changed their minds when we approached. 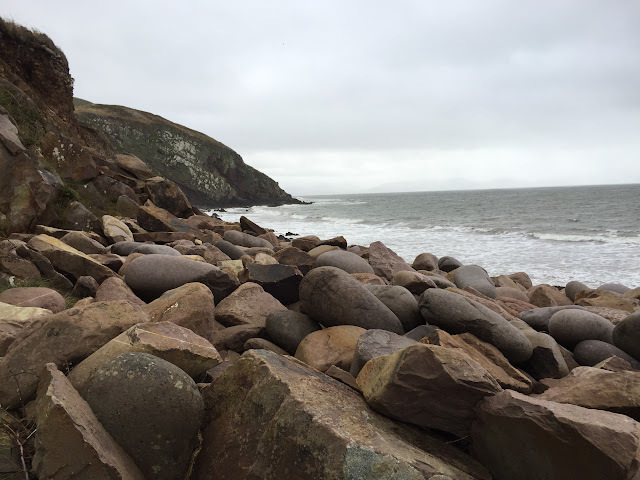 On the way to Dingle, the road hung over the water along the hillsides in the style of California's Big Sur and the Cabot Trail in Nova Scotia. Even under the overcast skies, the scenery was pretty spectacular. 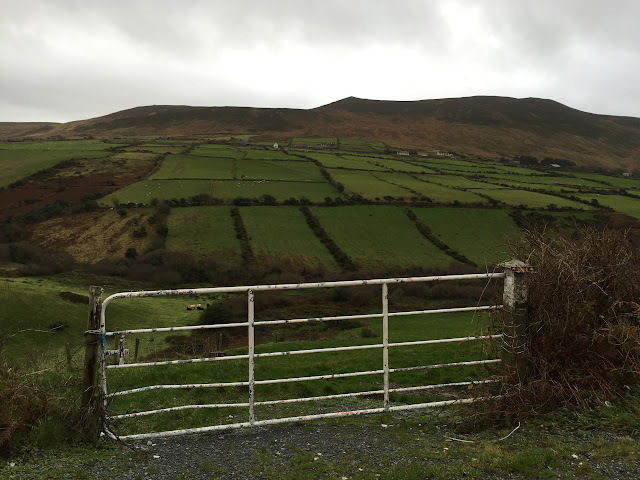 Along the way we drove past miles and miles of the patchwork quilt of small Irish fields along the roadside. Hedgerows in Ireland define property boundaries and mark town and parish borders. In addition, they offer critical ecological and biodiversity benefits. Their most obvious use is providing barriers and shelters for sheep and other livestock, but hedgerows serve many other purposes as well. 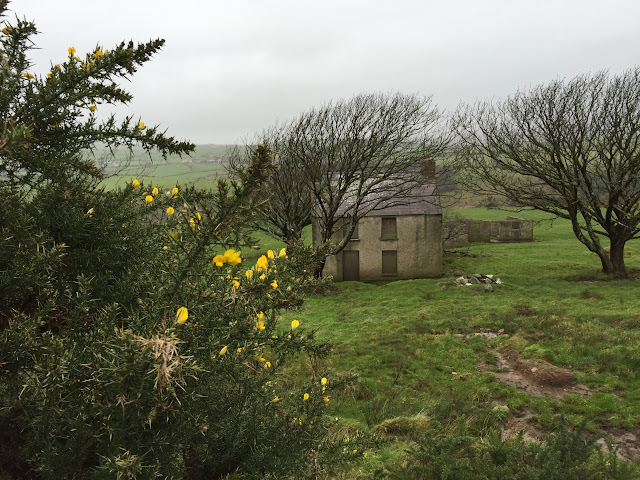 Even though it is home to one of the least forested landscapes in Europe, Ireland is able to host woodland species of birds, insects and even mammals in mature hedgerows. Hedgerows also provide wildlife corridors, linking woodland habitats and allowing species to travel from one to another. 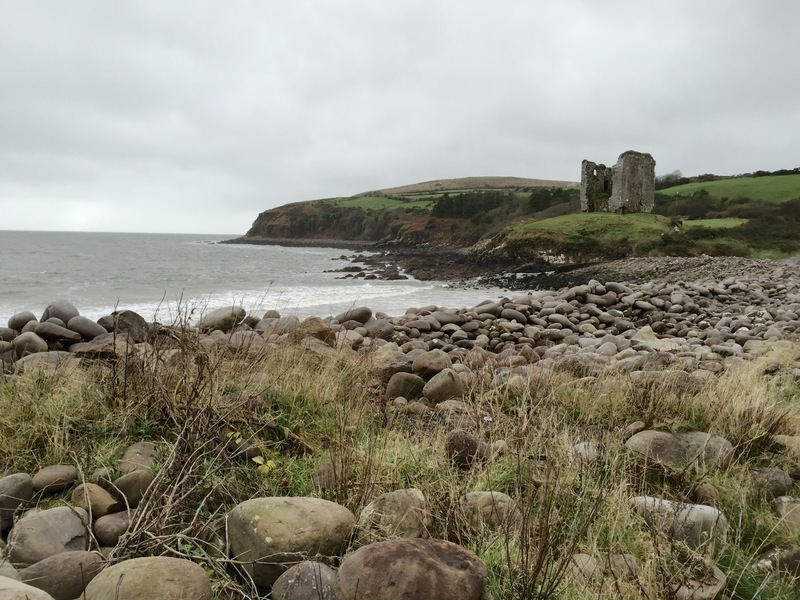 Near Dingle, we stopped at Lispole on the shore of Dingle Bay to check out the ruins of Minard Castle, a 16th century Fitzgerald tower house dominating a small hillock over a rocky storm beach piled with rounded sandstone boulders. Attacked by Cromwell's army in 1650, the four-story castle was reduced to three precarious levels, now closed to visitors due to widening fissures in its walls. We rolled into the little town of Dingle (pop. 1,920) just before 4 p.m. and found a cozy room at the Dingle Benners Hotel. Typically for winter, the hotel was mostly empty, but Mrs. Benners Bar was busy serving up a creative dishes made with locally sourced ingredients to a room full of townspeople. Happy with the convenience and the menu, we enjoyed a relaxing dinner while laying out plans to finally make it to Tralee tomorrow.